Complete all the Keeper's Room collections to receive a special object! 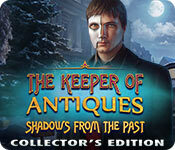 The Keeper of Antiques: Shadows From the Past Collector's Edition is rated 3.9 out of 5 by 24. Rated 5 out of 5 by Italia47 from It's no secret--I love this game! The Code of the Keepers is to 'keep' the existence of artifacts a secret, even from those closest to you. The Keepers maintain peace and safety throughout the world. 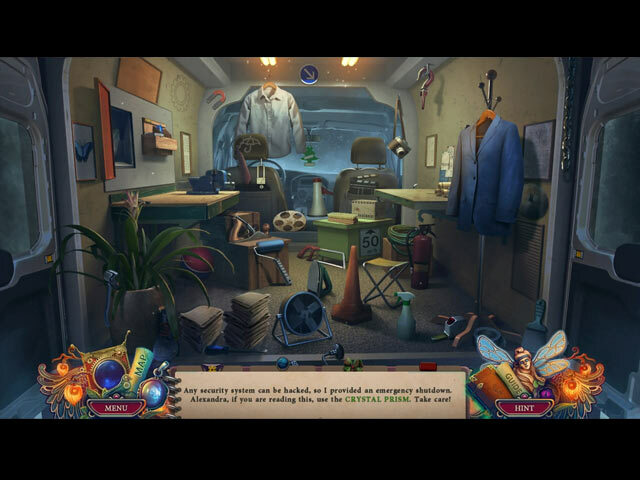 A Keeper must find artifacts and confiscate them from unauthorized persons. A Keeper must not use artifacts for personal gain. So on and so forth...Alexandra Anderson is the Keeper! (Echo, echo, echo!!) Anyway, someone damaged the Visual system apparently Paul Anderson got in and blocked the whole first floor. Alexandra, the Keeper needs to get in the building! And in order for her to enter, she needs to get through the security system; she also needs a crystal prism and will have to repair the damaged VISUAL system, which I call the EYE! Bing, bang, boom! Found what I needed, did what I had to, and got in. And it's not that this game is too easy, it happens to be very well-organized. There is a sense of order. That's one of the many things I look for in a good game! The tasks should make sense and they are so far. I'm 45 minutes into the CE version and I am really digging the storyline, and the variety of tasks, the game-flow, you name it. I know I may very well be running ahead of myself but I found me a winner! My gosh, there was so much to do within this time-frame already! So I'm hoping the flow continues because this is right up my alley, folks! Elefun devs, you're phenomenal! Ingenious tasks, beautiful artwork for this particular project, and the funky music sort of brings me back to bell-bottom/elephant pants days. I'm hoping the repertoire is not limited to just that one tune though funky as it may be. Even so, I'll be too engrossed doing other things and enjoying myself. The HOPs, mini-games/puzzles are very enjoyable. I need to get back to the game and find me some morphing objects, collectibles, and there are quite a few of those in addition to all the fun things you will need to do in this game. Oh, yes, there is a gadget and probably a few more but I don't mind. I guess some things are needed to prolong the game. LOL! I say go for it, folks. Try it out first. I can usually tell within five minutes into the game if I'm going to like it or not, and I'm hooked! I'm glad that I purchased it and definitely recommend it. Great job, devs! But once again, to each his/her own. Rated 5 out of 5 by spythere from Dancing Back in Time – Extras and Bonus Elefun has a funny way to ignore seasons. This is their second Christmas game, released in midst of summer :) Thus, we (Alexandra) are off to the Winter Festival in Hilltown and look forward to the big snowman contest. It's the 18th of December 1985, Alexandra is five and sits in the back seat, whilst dad is driving and mom just took a picture. Suddenly, a WW2 spy out of The Third Man pops up spookily in the middle of the icy road and tries to stop the car which starts to spin ... It was the very car crash that killed Alexandra's parents. The WW2 spy is the scientist Mr. Kutcher. He worked on a time machine and had tried for some time to get in contact with the Andersons. They possess a magical item which he dearly wishes to buy or to borrow, since it is the last lacking part of his invention. He had written polite letters and gotten rude answers from Patrick Anderson. So he mindlessly tries to flag down their car and causes havoc. In the throng of events, Kutcher's invention is confiscated as “dangerous artifact” by uncle Paul, and Kutcher ends up in the mental asylum. Who can blame him for becoming a vengeful "mad scientist"? Kutcher has of course not given up yet his dream to make his device functional. Like the current POTUS, he believes in “alternative reality” and that all will be for the greater good. Hence, after 32 years, he breaks out of the asylum and into the Keeper's archive, to steal back his time machine … For once we don't have to save the world, only our family, that is, uncle Paul, our parents and our own self in the age of five. How does it feel to meet your long ago deceased parents? to encounter the little girl we once were? Because we are transferred into winter 1985, we see a lot of snow heaps and Christmas knick-knack. Although they did reuse some scenes from former games, HOPs are entertaining, varied, themed and cleverly integrated into the story, sometimes spread out over whole rooms. As always they contain on notes or screens a lot of background information. Dialogues and voice overs are top-notch. Mr Kutcher is always good for little surprises, like remote-controlled, burning toy helicopters, something happens always, we never get bored. I really enjoyed the game, in spite of the hapless loading window. Well, I had complained several times about these flow stoppers, but it's too late now, I guess. Shadows from the Past is already the last Keeper of Antiques. They probably simply didn't want to change their game engine anymore, knowing that the series would end soon. But this game's highlight are clearly the soundtracks; I'm completely swept away. What a treat! It's mostly Ambient with a lot of IDM, inspiring dance music - and I've never heard anything as modern at Big Fish. In fact it is the very kind of sound I usually listen to. These jaunty, snazzy, subtle and ironic tracks are almost too good for a HOPA; I'd have bought them anyway, independently from a game. You have to download it and listen at one stretch to hear how the album is flawlessly, completely rounded. This CE is worth to be bought for the soundtracks alone. If you want to scintillate with your music taste, let them play at your next party ;) EXTRAS: - Guide: main game 22 pages, 22 scenes, bonus chapter 9 pages, 9 scenes. - 9 Wallpapers, 3 Screensavers, 10 black and grey drawings in the Art Gallery - 5 Achievements, plus as always a lot (11) game related bogus rewards - 22 excellent Soundtracks - Collect 36 puzzle pieces to play four easy puzzles. They reveal pictures and information about Alexandra and Paul Anderson, William Kutcher, Patrick and Emily Anderson, Frank Murphy. - Find 31 morphing objects (one per scene) for an achievement - Collect 31 losely game-related items to fill your junk room. This collection is a big disappointment. We can't even see what exactly we picked up, there is no enlarging (except two pictures), no interaction (only with one single doll), it's merely a dull shadow of former collections. 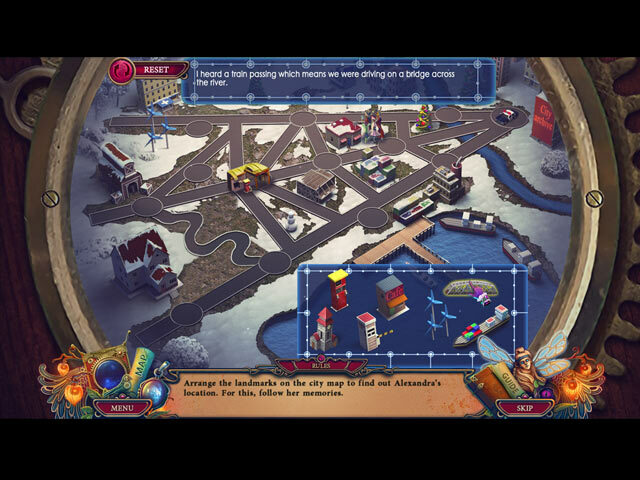 The whole game contains 20 HOPs and 25 puzzles which as usual we cannot replay. The BONUS CHAPTER is a sequel and to some extent related to the main game. When Patrick Anderson died, he left behind the unsolved case of the orphaned boy Frank Murphy who had a mask which allowed him to appear as another person. Since Patrick was not able to neutralize the dangerous artifact, Frank's personality got muddled, and he ended up in the same asylum as Mr. Kutcher. Together, they escaped … It's a pretty unlikely story with this “unremoveable” mask, rather a random add-on, although it includes a frightening kidnapping. But I'd have preferred to learn more about Mr Kutcher's fate. Rated 5 out of 5 by Kay_Erin from More excellent adventures with Uncle Paul and Alexander Good series with the guardians of magical antiques tracking a dangerous (and crazy) scientist who wants his invention back. NB: There are at least 3 objects to find in each scene: A puzzle piece (often found when clicking a close up) a morphing object, and a collectible. I got 33 of the 36 puzzle pieces, 25 of 31 morphing objects (I may have missed more of those early on) and 31 of 31 collectibles. Also, in this game it important NOT to click too quickly before you have a chance to read everything,and listen fully, otherwise it disappears and/or you lose what is said.I look forward to playing this again. I like these characters who like and respect each other. This is a great series I recommend! Rated 5 out of 5 by FunwithBigFish from Best I've played in 2018 I purchased the game but haven't completed it yet due to time constraints (I think it's pretty long) but I wanted to give a review because I feel like this is the best game I've played this year. It has a very good story line that progresses nicely through the game. There are whimsical features that are fun to discover. There isn't much back and forth. You have to do a little searching within the HOs and I'm really enjoying the puzzles. A few have taken about 5-10 minutes for me to solve, which is awesome. I really appreciate the attention to detail in this game. I have the others in this series, and I think this is as good as the first. It ties really nicely with the others. Great job devs! Rated 5 out of 5 by MaryCricket from The past can never be changed After playing the main game and Bonus Chapter. I have to say I liked it. There are puzzles, morphing and Collectibles to find ( in the bonus chapter as well) I took my time playing this game to enjoy the story line. which I did. Imagine going back and meeting your parents and your younger self at the age of 5. I could hear Alexander was all choked up seeing them. . After playing the bonus Chapter. Alexandra did change the past because her parents died differently. Rated 5 out of 5 by gyanda from Fascinating! This is a great game! Normally i don't play for hours - but this game's storyline is so interesting that i keep playing and playing. And the way the story unfolds in the graphics is fantastic! I can only repeat, great game! Rated 5 out of 5 by SparkleGlow100 from OLD, SHABBY, DUSTY, MYSTERIOUS with a SCI-FI vibe Available at BFG since 2018 Review based on completed game and bonus game. ****Musty, dusty books, moths fluttering around outdoor lamps and old meters and gauges in all sorts of old forgotten rooms. **** Great mix of varied scenes – you never spend too long in any one place. Find your way around the edges of a city, an abandoned amusement park, harbor-setting, laboratories and warehouses. There's all sorts of electronic equipment to fix and find everywhere. ****Ambient and very relaxing music – sort of electronic-spacey sounding. ****Artfully told storyline. Characters done convincingly. Mild and infrequent violence. Not a spooky game. GRAPHICS: Excellent. Great mix of real objects mixed in with enough artwork done on them to make them look...well, like art! Spacious and well-constructed in most scenes. HOPS: All really enjoyable. About 10 or 12 in the main game and 4 in the Bonus. Mainly equipment. There is a match-3 you can switch over to. PUZZLES: Many were a lot of fun. SOUNDS – 4 adjustments: Each important category has its own control. CHARACTERS: Regular but intermittent interaction. COLLECTOR'S EDITIONS: This had so many extra things that I enjoyed in the game itself. There are the 3 following categories to collect for: **Plain jigsaw shape **Morphing objects **Items for a collection. In addition, the BONUS game is EQUALLY enjoyable to the main game! Rated 5 out of 5 by 1955raven from BACK IN TIME........ ON THE TRAIL OF A MURDERER, ALEXANDER MEETS UNCLE PAUL IN 1985, THEN DISCOVERS SHE MAYBE ABLE TO SAVE HER PARENTS! ALONG WITH AN ARTIFACT THAT COULD CHANGE EVERTHING! ANOTHER GOOD ELFUN GAME! I LOVE THERE ARE SO MANY THINGS TO DISCOVERY IN THERE GAMES, AN THE ANIMATION OF THE VARIOUS OBJECTS MAKE THEM EVEN BETTER!! Rated 5 out of 5 by Majestyx12 from Time Machine and Doppelganger Based on the trial I just finished the last one in the series hours ago. This one is so much better. I like the storyline in this one. Going back in time. I didn't mind the gadget. I think when you battle supernatural things you need equipment. The music is good in my opinion with twenty two soundtracks you aren't hearing the same thing over and over. When you check the soundtracks note that the first one is numbered zero. It has twenty hops and twenty five puzzles in the game. I liked both hops and puzzles in this game. I love all the CE extras Thirty one morphs. Thirty six puzzle pieces to make jigsaw puzzles. Thirty one Collectibles. I kept checking the map to see if I had a star for finding all my collectibles in the scene. If it has replays I can't find how to access them. This will be a buy from me. Try it for yourself.